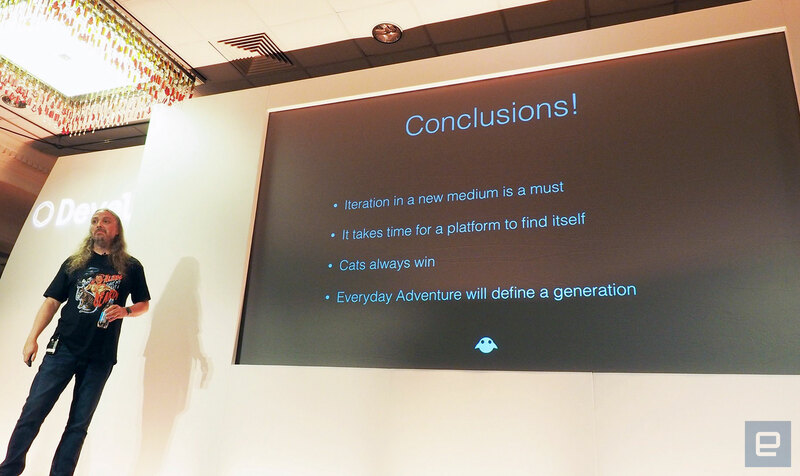 The startup's Chief Game Wizard believes "everyday adventure" is key to the new medium. Magic Leap CEO Rony Abovitz recently said at an investor conference that the company's 'mixed reality' headset (?) "is not far away" from launch, whatever that really means. While the mysterious startup might be closing in on consumer-ready hardware, it's still in the process of discovering exactly what 'mixed reality' is. 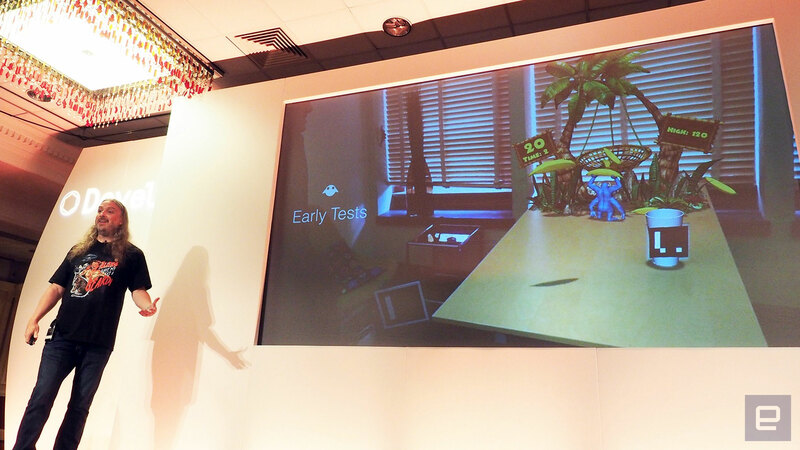 Delivering the opening keynote at gaming conference Develop:Brighton today, Magic Leap's Graeme Devine said, "There's huge expectations that mixed reality will come of the gate and, oh boy! It'll be here and it'll be just like Minority Report right away... And no, we've never seen that with any platform. So that ask is impossible." Magic Leap is a startup that feels like it came from the mind of a Silicon Valley writer, rather than having any place in the real world. It's raised well over a billion dollars in funding, counting giants such as Google and Alibaba among its investors, and yet most of the world is all but oblivious to what the company is working on behind closed doors. We know it's some form of augmented reality wearable, and one that uses digital light field tech to project images into your eye, mimicking the natural way light hits your retinas. The tech is supposed to make digital objects so real it's "like dreaming with your eyes open." Magic Leap doesn't like the term 'augmented reality.' As Devine put it today, if virtual reality immerses you in another world, and augmented reality puts digital objects on top of your world, then Magic Leap does neither. It's developing 'mixed reality,' where digital objects and characters become part of your world. It works alongside the context of your reality: From what time it is to where you are, to what's in front of you, where you're looking and who you're with. "Mixed reality is digital content that interacts with the real world, and with you," says Devine. The company imagines mixed reality as an entirely new platform. Not a peripheral, like a console is to a TV, or a VR headset is to a PC, but something new. "Mixed reality has the opportunity to lift people's heads up again, and put information back out in front of people... Mixed reality has the opportunity to actually place you back into where you should be instead of hanging out on a smartphone." The only problem with creating something entirely new is figuring out where to start. "If the platform is to succeed, we need a very different kind of application," Devine said. "And there, we've no idea of the controls because it's everything. It's my hands, it's my head pose, it's my gaze, it's my smartphone, it's things I write down on a piece of paper, it's controllers... it's everything. It's everything that we use in the real world today. And that's really hard." Devine is adamant that "mixed reality is going to change the world" -- which he says with all the enthusiasm you'd expect from someone with the title Chief Game Wizard at the world's most secretive and hyped startup. He knows, though, that people won't be buying whatever hardware the company is cooking up, but experiences. "It's most of what we do." Describing the company's experience prototyping process, Devine says Magic Leap is still learning what mixed reality means. But there are a few key musts internal pitches are built around: The idea must be indispensable and something you'd return to every day. It also has to be something only mixed reality can deliver and sell people on the entire concept. And most importantly, "can Magic Leap learn from it?" Devine compares what Magic Leap is doing to the evolution of the TV. Everyone has one, it has become the vehicle for other creative formats like games consoles, and various technologies have evolved around it to make perfect use of the display. But as a platform, it took decades to get there, and Magic Leap must make a similar journey. Despite the startup not knowing exactly what mixed reality is or where it needs to go, Devine does believe in the existence of a 'killer app' he calls "everyday adventure." There's a tech demo/concept Magic Leap likes to revisit called "Ghost Girl." This specter, known as Alice -- Magic Leapers are never far from an Alice in Wonderland reference -- lives in your house, and together you discover, over the course of endless meetings, more about her story. "Alice is a companion that spends time with you. She interacts, she has conversations with you, she talks to you, she hangs out with you. All these things are simmering in the world, they are not very far away... Alice can be as real a ghost as you want a ghost to be." "The key thing is everyday adventure," Devine continues. "Things you might actually want to do with Alice every single day." "And it can be Star Wars, it can be Harry Potter, it can be Finding Dory... and I can be a lawyer, I can be a plumber, I can work at Starbucks. I will have everyday adventure added to my life, by an app store of realities." This is likely a long way off though, remember -- the seed of what mixed reality could be. 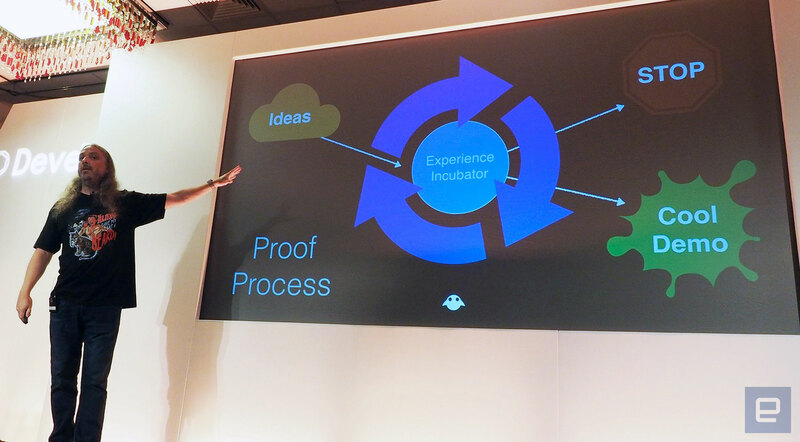 "Iteration in a new medium is a must. It will take us time to get there, to that conversation, to Alice being real. But I see it. I see it in my wanderings. It's coming. It's there. We will have that." "Everyday adventure, I believe, will define a generation."